The engine in your car or light truck generates a tremendous amount of heat during operation. If the excess heat is not managed and eliminated the life expectancy of your engine is almost zero. 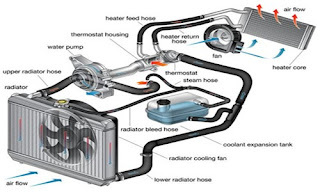 The component in your vehicle that is responsible for removal of the heat generated by your engine is the radiator. As coolant runs through the passages in your engine it absorbs heat. When it reaches the radiator, that heat is released into the air flowing between the fins. This heat exchange is critical to protecting your engine from damage. The most common cause we see today, for failure of the radiator, is leaks caused by lack of maintenance. Modern coolant has seal conditioners designed to protect the seals and seams in your cooling system. Without it, heat and acidity can deteriorate the plastic tanks and cause the tank seals in your radiator to fail or even the plastic tanks to split. Another common cause for radiator failures is clogged internal passages. Without proper maintenance, scale and rust will be carried into your radiator and over time clog the internal passages. This reduces the radiator's efficiency and may cause over heating. So, bring your car to Kool Kar Auto Repair for cooling system maintenance that will protect those vital parts like the radiator.